Klipsch speakers are such a big part of audio’s history, and such a big part of American audio history, the first round of listening had to be all-American. Just because. Taking full advantage of a custom made VPI Classic One turntable, Eminent Technologies tonearm and the latest Statement cartridge from Grado, the gorgeous walnut Forte IIIs went front and center in my listening room, powered by a full Pass XS front end, funneled through Cardas Clear cables and a freshly rebuilt Audio Research D-79 power amplifier. So we had a bit of vintage, current and custom all in the mix, but American hi-fi to the core. 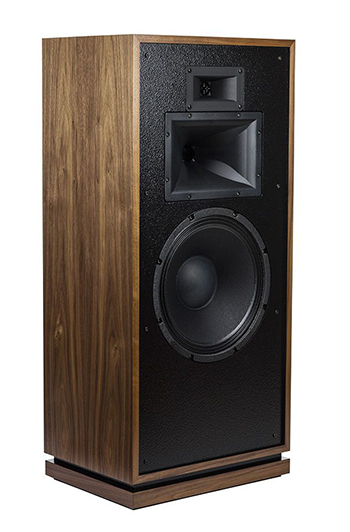 The Klipsch Forte speakers have been around for decades, but the current model III has a number of updates that you can read about here (link) on the Klipsch website. Our review samples arrived in American Walnut (which is my personal favorite) but distressed oak, black ash and cherry are also available. Just like my LaScalas, built in May of 1976, each Klipsch Forte is hand assembled in Hope, Arkansas. All Fortes feature book matched veneers and upon completion, are signed off on by the person completing final testing, as they’ve always done. Queing up Kiss, Alive! only seemed appropriate. Thanks to a 99db/1watt sensitivity, this combination nearly blew the windows out and “Firehouse” never sounded better or, shall we say more alive? Staying with the live vibe, and moving from the Motor City to the City by the Bay, the legendary Friday Night in San Francisco, featuring Al DiMeola, John McLaughlin and Paco de Lucia is next. In addition to the frantic fretboard activity, you can almost feel the tension in the room between these three guitar greats as they streak through “Short Tales of the Dark Forest,” with the audience clapping, cheering and gasping in the background as the music swells and fades. With so much discussion in audiophile circles about holographic imaging, pinpoint focus and the like, the fourth dimension is dynamics, or the lack therof. While the Forte IIIs don’t image like a pair of minimonitors, they paint a large, lifelike sonic picture that doesn’t subdue the wide dynamic swings you get when attending a live performance. Besides, when was the last time you went to a concert, rock or otherwise and heard “pinpoint imaging?” What the Forte’s do, incredibly well, is recreate a sense of size and spatial correctness that few speakers match. Next on the list, Jeff Beck’s “Bigblock” from Live at Ronnie Scotts. This track opens with a low, growling bass line that fills the room, and throughout the album, it’s easy to hear the spatial cues that let you know you’re in a small club. As Jeff Beck’s signature Stratocaster screams in and out of the mix, the extra headroom that the Forte’s offer helps take things to 11. These speakers do an incredible job at keeping the presentation clean at moderate to high volume, yet even when played more softly adding the extra liveliness to keep the listener engaged. Thanks to a 99db/1watt sensitivity rating, you can use the Forte IIIs with small tube amplifiers and get great results. As good as the Fortes are at pinning your ears back, their wide dynamic range makes for an incredibly open presentation at low levels. Substituting the 20 watt per channel Nagra 300p amplifier drives these legendary speakers more than loud enough, but at low to medium levels provide a heavenly experience. If you want to keep it inexpensive, fun and tubes, think a restored Dynaco Stereo 70 like Klipsch shows on the website. If you can imagine listening to Led Zeppelin at a modest volume level, the Fortes show off another side of their personality. The bass line in “No Quarter” is simply stunning, revealing perfect harmony between the rear-firing, 15” passive radiator and the front-firing 12” woofer. There is a low level clarity and linearity here that makes the Fortes just as much fun to listen to at a modest level as an Earth shattering one. Reluctantly, a suite of female vocal tracks are investigated, because that’s part of the audiophile drill, but when your neighbor flips you the keys to his Hemi Charger, the minute you get out of his sight, you don’t head for Starbucks, you head for the nearest stoplight and do the biggest burnout you can muster. That’s how fun the Forte’s are. You could listen to Ella Fitzgerald, but you play Betty Davis. Which is exactly what I did, though Ella sounds lovely through the Fortes too. Listening to her snarl through “If I’m in Luck, I Might Get Picked Up,” illustrates the grit in this funk icon’s voice loud and clear. 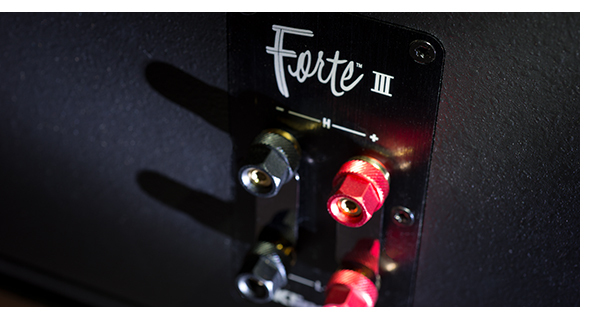 As mentioned, with the high level of sensitivity the Fortes offer, pretty much any amplifier will get you started on your journey, but make no mistake, these speakers offer a high level of resolution to go with their wide dynamic range. The better your components, the more finesse they are capable of. Much like my vintage LaScalas, I’ve heard Klipsch pooh-poohed by the audiophile crowd, because they’ve only heard them driven by a mass market receiver at Best Buy. My Sonus faber speakers and Focal speakers sound lousy under the same conditions. Even though the Fortes can pretty much be thrown in your room and sound ok, paying attention to getting the speaker to rear wall distance right plays huge dividends. First, what you probably perceived as boominess from this speaker when you heard a mediocre demo was the rear firing passive radiator fighting the woofer. Get the Fortes spread out in your listening room where the stereo image is how you like it, then move them back and forth in relation to the rear wall, first in 6-12 inch increments. Pay careful attention to the upper bass response and the blend with deep bass. When you nail it, the Fortes disappear in the room, and not only will you get much smoother bass, the stereo image opens up tremendously. Then fine-tune the toe-in the same way. When you’re right there, the sound just washes over you without sounding harsh. A little too much and the Fortes will squawk at you, not enough and they sound lifeless and diffuse. Then crank it up and enjoy. For $3,500 a pair, the Klipsch Forte IIIs are tough to beat. 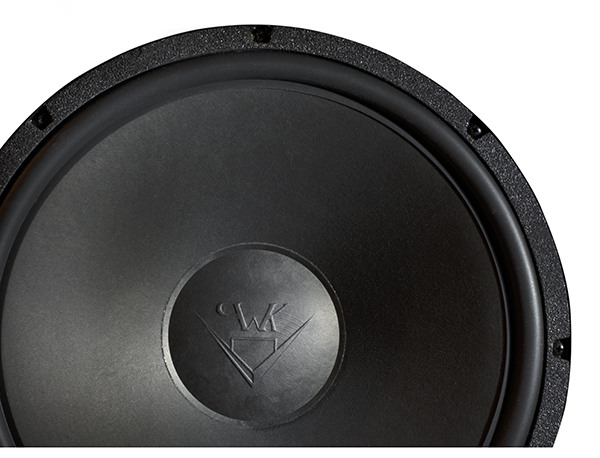 They exude old-school style, combining it with present day passion and quality control, resulting in a speaker that’s easy to live with, and works well with nearly any amplification you can pair them up with. I bought the review pair. You need em too!